It was the all too normal 4am wake up for the flight to Dallas. Unfortunately for us, this trip departs from LaGuardia, the worst airport in the world made infinitely “worser” by the ongoing construction to bring this airport out of the dark ages and into the stone ages. A direct quote from Al, “They should just blow it up and start over.” Amen to that. Instead, they will try to run the airport normally during the 25 years of planned construction. Needless to say, traffic at LGA was downright absurd at 5:15am. It was made much worse by the fact that the DOT had 2 lanes closed on the LIE at 5am on a Friday. Just what the hell were they thinking…”Hey it’s rush hour, let’s close 2 lanes.” Brilliant! All right, now that my rant is out of the way, today’s flight is courtesy of Virgin America, a first time vendor on the Quest. Virgin gets poor marks for flying out of LGA, but major props to the gate agent whose thorough tongue lashing, in advance of those trying to sneak on with an earlier group, put a stop to any group jumpers. Take a lesson all other airlines. If you are going to continue with this proven inefficient manner of boarding an airplane (see Mythbusters), then at least do it this way by scaring the hell out of people who do not board with their group, like me. We arrive in Dallas at Love Field and proceed to obtain our Silvercar rental. We first used Silvercar in San Francisco and I am a big fan, but the Dallas location does it the 100% pure Silvercar way as described on their web site. It was a very smooth pick up process, as we were picked up in our car and after some very brief “show me how this works” stuff, off we went in an almost new 2017 Audi A4. The drive to Waco was awesome as this thing was an absolute pleasure to drive. I think I missed all of downtown Dallas while enjoying driving the car. Not to mention that you can hit some really nice speeds on the open roads of Texas without even noticing how fast this car can go. Of course, I never went above the speed limit, or at least what I perceive the speed limit in Texas on an open road should be. I sent a text to Beth that I may have found my next car. We shall have to see what the car prices out at. Audi sponsorship opportunity here, don’t let it pass by. We arrived in Waco and I ask you to please do not do the math on how far the drive is and how long it took us, because that computation may be slightly above the posted speed limit, but again not the speed limit that exists in my head. Awaiting us in Waco was our two guesters for the trip; my Uncle Vinny (not to be confused with my cousin Vinny who is serving time in an Alabama prison) and his friend Robert Marino, Bobby. I have been trying to get my Uncle to join on a Quest trip and with Bobby living in Dallas, this was a perfect fit. 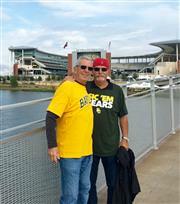 They spent a few days in Dallas prior to coming to Waco enjoying Jerry’s World, also known as AT&T Stadium. So a warm welcome to our two guests and to what I hope will become an annual occurrence for my Uncle on a Quest trip. As a side note, Bobby is married so any inappropriate behavior attributed to him will be redacted, but if you hold the paper up to the light you may be able to see the redacted parts. In fact much of the text of this trip report may be redacted to protect the married and the guilty, but mostly to protect us from lifelong ridicule from our kids. All I can say is that it was a good thing there were no kids on this trip. We all met up at the Baylor athletic offices as that is where we would be meeting Ross Rastede of the BU Athletics Marketing Department, who would be giving us a grand tour of Baylor University athletics. The first stop on the Ross tour was a walk around the athletic administration building which houses the RGIII Heisman Trophy as well as other significant trophies. Then it was onto the practice locker room, which houses an RGIII locker/shrine. Are you sensing a theme? This was pretty nice for a practice locker room. I know some other schools that would give a whole lot for their game locker room to be half as nice as Baylor’s practice locker room. Then attached to the locker room it was onto the weight room, where we played guess what is in that jar of protein powder. Hey NCAA, that was a joke, look up the definition of a joke. In context, this may not be the best place to be making jokes, but I will touch on that later. After all the travel, lunch was soon a necessity. Ross recommended George’s as a distinctly Waco place and we are always up for the local flavor, so off to George’s it was. We let Ross take the lead and we were not disappointed. First off it was Crazy Wings, which is chicken, pepper jack cheese, and jalapeno wrapped in bacon and deep fried. Even I, who does not like chicken, was a huge fan. I mean how could you not; cheese bacon and fried. You could probably wrap anything in that triumvirate and it would be great. Next course was chicken fried steak all around, which for those who have never been to the south is steak and not chicken. Again, fry anything and it is bound to be good. Plus it was and voted best of Waco 15 years running. Good choice Ross. After lunch, being thankful that we were not all in the bathroom from a fried food induced illness, we resumed the athletic facilities tour. The next stop was the Baylor Bear habitat and two live, very cute, bears. I love bears. You really do have to wonder what kinds of insanely stupid things that brain dead humans will do in order for warning signs to say the things that they do. Seriously, it is necessary to state “Please stay on walkway, bears will bite”. This is one dumbass litigious country. Beth concurs. Then a short walk across campus and the main fountain (which was being repaired) on the way to the indoor practice field. It was not long ago that indoor practice facilities were a jewel, now in the arms race, it is a price of entry. Baylor has one and we stood on it. Next stop, Baylor basketball. There is quite a bit of hardware in the basketball arena and the Baylor women’s team is quite the national power. When we stuck our head out onto the main floor, the women’s team was in a practice. We quickly departed (the reason shall be unspoken although we all know why Ross) and went to the basketball offices. These were really nice offices and I loved the decor and etched glass with tournament brackets. I took plenty of pictures for Beth and our home office…someday! Maybe when we grow old, Beth will actually look at all the Quest pictures. On the way out, we passed by the practice courts where the men’s team was practicing. These guys had some height. After basketball, it was on to baseball, which is one of the sports that Ross oversees in his marketing role. This allowed him to drive his quite nice pickup truck right up on the sidewalk to the stadium. Privilege has its advantages. It must have been scout day at the baseball venue as there were a number of people holding radar guns and many players out practicing…in November. But then again, college baseball starts in February so time to get at it. We did get to meet Coach Rodriguez and talk a bit of baseball before departing. There will be no mention of Al riding a bear here. Upon leaving the baseball venue, Ross asked a strange question…Do you want to see equestrian? I can honestly say that was the first time we have ever been asked that, so of course the answer was “sure.” Good decision….very good decision. This is another sport that Ross oversees, and upon spending time there we could see how “close” to this program he is. Upon arrival, Ross attempted to show us around but deferred to Ashley who was at the front desk. Ashley is the Director of Operations and former member of the team and we were all glad to have her take over. We then proceeded to get a very interesting and thorough introduction to equestrian on the collegiate level as well as an up close introduction to the horses. We happened to be there around when practice was finishing up so we got to enjoy (again, up close) the horses coming in and being cleaned in the stables. Too close for some. It was very interesting and a great place to spend a bunch of time. I am sure we all got educated a bit as well both about equestrian as well as Ross’s personal life, which does seem to be athletic centric. The remainder of this paragraph about Ross’s dating history and future shall be redacted. Needless to say we have a new sport of interest on the Quest, equestrian. Not sure how many times it will come up, but we will be looking for it. Al actually purchased a shirt from the bookstore in support of the equestrian team (not sure how that helps them) and promised to take pictures wearing it in front of famous NYC landmarks once it warms up back home. We know you are all anxiously awaiting seeing that. Beth could not help but chime in “That is such an Al move!”. It was at this point we parted ways with Ross so that he could get a few hours of work done. But we would meet up later that night to do a tour of the stadium. It was time to make the usual school purchases at the bookstore. All four of us did our damage, including the previously mentioned Al buying a Baylor equestrian t shirt. Now that is true support! We then walked around campus for a bit. It was decided to wait and have dinner after the stadium tour, so we had to kill some time around campus. For this reason and this reason only, did I actually purchase a drink at Starbucks. God only knows what it was and I can probably never find the words to order it again. All I know is it cost $8.95 for a tall which is a small in real life non Starbucks world. Not really, I won’t know the actual cost until the loan paperwork comes in. The content of the discussion over coffee has been redacted but it shall suffice to say that the main topic was the tour and mostly focused on the final stop on that tour. As evening fell, it was time for the McLane Stadium tour. This was not a personal tour but rather a group tour of which we were four of about forty or so large program boosters that we were lucky to be part of. We had to promise not to embarrass anyone. The tour was jointly led by Ross so we did have some fun with that. The first stop on the this tour was to the area recruits are hosted before games. It was very carefully mentioned that this is only before the game because once the game starts, recruits are not allowed in the lounge. Must be one of those fantastic NCAA regulations that makes tons of sense. Then it was out onto the field. It was dark and the lights were off. Cool views. We roamed around the field for a few minutes before heading back inside and into the Baylor locker room and coaches rooms. The Baylor locker room, in the oval shape of a football, was very nice and one of the very few, if any, where the entire team was seated around a single common area. It was strictly forbidden to touch anything in the lockers the night before the game. Did the group listen? See previous discussion about the Bear habitat. After the locker room, we toured the press conference room before the group headed upstairs to the production room where all game day operations are anchored. I snapped a shot of the WiFi password in case we needed that tomorrow and took in the views of the stadium from up top, in the dark. Ross gave a short tutorial on how they produce the in-game operations, which sounded an awful lot like organized chaos, which it is, but much of it is his responsibility, so there is some level of respect and admiration for him in pulling it all off. It’s not all automated (like how this Trip Report just happens for Al). Dinner was at One Thirty Five Prime which was one of two recommended places from the ladies at equestrian. It was a really good steak and really rounded out the day along with the steak we all had for lunch. Two steaks in one day is a very good day. There were plenty of drinks and much inappropriate conversation which will not be detailed in an effort to protect the highly guilty. Needless to say but the drinking and conversation brought to the Quest by Vinny and Bobby certainly was very lively and highly inappropriate. Just the way we like it. It was then time for bed, so off to the hotel for a not at all decent night’s sleep. We all awoke to waffles in the shape of Texas, courtesy of the Best Western. Waffle makers have certainly been our savior for breakfast on the Quest. Not sure if it was the drinks from the night before or roommates who snore (Bobby, this one is at you) but we did not appear to be the rested and ready crew. But waffles and syrup certainly helps, except when you are supposed to be gluten free (Al, that one was for you). After slogging along, we headed out to McLane Stadium for some tailgating. Our good friend Ross was leading the fanfest area, so that was as good a destination as any at this point. When pulling into the parking lot, it occurred to all of us that the car in front of us was on fire. Now here is a word of caution that should not really need to be said, yet in this case it does. When your car is on fire, pull over. Do not keep driving. Do not pull into a parking spot NEXT TO OTHER CARS. Moron! And yes, the car was on fire, not just smoke. Of course we stayed around to watch the police department and then fire department come to put it out. Al adds that we were part of “the crowd” that kept inching closer and closer to the car on fire. Does the level of intelligence decreases the further south we go? Or further into the season we go? Sounds like a research project for an intern. And with that, we had arrived at McLane Stadium. 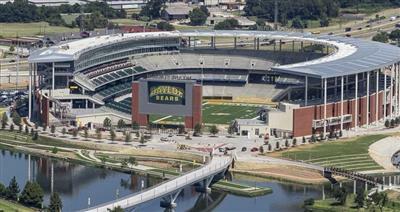 We parked on campus and thus had to cross the Brazos River to get to McLane Stadium. What a beautiful setting. The pedestrian bridges crossing the river to the Stadium right on the water made for a great environment and quite picturesque. Directly over the bridge at the front of the stadium was the obligatory RGIII statue and we did what you do at such monuments, took pictures, and no inappropriate ones either. After that, it was onto fanfest and tailgating. We spent some time at the fanfest indulging in some of the food and drink being given away in exchange for signing up for some contest you will never win so the company can obtain your contact info and spam the hell of you. So that was fun. I did try maple soda. It is exactly what you think in that it was like drinking maple syrup. What could not be good about that? I will tell you…it went down well but then just sat right in my gut all day. Not worth it. We happened to be right in the path of the Bear Walk so we joined the line and watched the team walk in. This had to be one of the more uninspiring “walks” of the few that we have seen. Not a wide sample, but this was certainly missing something and had zero pomp and circumstance (Is that how you say that?) other than a few cheerleaders. This could have been a bit of foreshadowing. After all the samples, that made us hungry for some BBQ. Actually not really hungry, but it was there right in the middle of fan fest and it smelled really good. Plus, I had to try to move that soda along. We did some more hanging out, enjoying the environment, and catching a bit of the country artist performing for a few people right on the water before we headed inside McLane Stadium. We had pre game field passes so we headed onto the field. The four of us watched warm ups, hung around with the mascot, taunted the refs (just kidding), and had a generally good time watching all the pre game festivities. As game time approached, we witnessed one of the better school traditions that we have seen, the Baylor Line. The Baylor Line gathers at the south end of McLane Stadium, runs onto the field, and creates an enormous human tunnel to welcome the football team to McLane Stadium. After the team has entered the stadium, The Line makes a dash for their seats in an exclusive Baylor Line section behind the opponent’s bench to cheer on the Bears. It is a very cool tradition and definitely helps amp up the stadium. First, we do have to speak a bit about the backdrop of this game. In 2015, a football player was convicted of sexual assault on another student. The trial and subsequent conviction put a spotlight on the manner in which Baylor handles sexual assault allegations, specifically after the judge called Baylor’s internal investigation “insufficient” and did not permit the internal report to be used during trial. Baylor’s Board of Regents hired an outside law firm to investigate (a report that was not released to the public) and the Board issued a “Findings of Fact”. This stated that Baylor did not effectively implement Title IX, administrators discourage reporting of sexual assault, and the athletic department did not properly address sexual assaults. The Board then fired President Ken Starr, but amazingly kept him as Chancellor and as a professor at the law school. Ken Starr did ultimately resign those posts. Head Football Coach, Art Briles was fired as well. This firing has not sat well with the Baylor assistant coaches, boosters, and fans, who have been calling for Coach Briles to be reinstated. The entire incident has cast a dark cloud over Baylor football and the University as a whole in its handling of this issue as well as sexual assault claims in general and Title IX issues. Much more of this issue has and will come to light and I provide the above merely as a backdrop and is not meant to be a full and complete story. Second, I should mention that we both picked Baylor. Baylor entered 6-1 having lost the week prior to Texas by a single point. I thought they would rebound, although watching the Bear Walk I had second thoughts, but not enough to change my pick. I should have. Now the game. 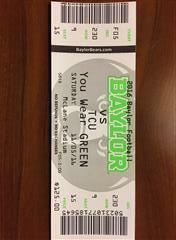 Baylor lost 62-22. I am not going to recap the game as I sometimes do because it was a rout. I hesitate to say this but with everything going on around the program, it appears to me that this team has quit on the season. Baylor gave up 900 rushing yards (actually 431) and 688 yards in total. That is all you need to know. The RB’s for TCU, one of whom looked no taller than 5’ 7” ran all over Baylor. Not around, over. To further my claim, Baylor has subsequently lost the last six games of the season to finish at 6-6 after a 6-0 start. This team has bigger issues going on and they were able to hold it together while undefeated with major goals in reach, but once they lost by a point to Texas, the dam broke. So, as I said, no need to do a game recap here. What I can say about the game is that we had the TCU Showgirls to watch. That did hold our interest. Why did it just come out at the end that Bobby knows their coach? Really! Needless to say, Bobby will be coming with us when we go to TCU. Enough said on this topic before we get into any more trouble. Also noted that Heather from our previously mentioned equestrian experience, was sitting nearby and stopped by to chat on her way out. She was not at Crickets. Now, as I write this trip report, an associate AD has been arrested for misdemeanor assault on a reporter following his actions at the conclusion of this game. It is fair to say that Baylor has an image issue not to mention the very real issues surrounding Title IX and its handling of sexual assault cases involving football players. It is not made any better by the fact that coaches, players, and boosters are calling for the reinstatement of Coach Briles. It’s a mess. Post game was dedicated to finding some place to watch Alabama versus LSU. Hooters it was. Another healthy meal of all deep fried food stuff. Yum. It’s the fat that makes it taste so good. Anyway, while at Hooters Ross reached out and we decided to join him at Cricket’s Grill & Draft House. I am somewhat certain that neither Bobby nor Vinny remember much else from this night and details will not be provided here. Plus the pictures will be in a password protected part of my hard drive. Again, this all done to protect the very guilty. “It was fun”. As Al reviews this write up I see the progression from simply the guilty to highly guilty to very guilty. Mike Packer, you may be called upon. The next day was the usual travel home and watching Sunday NFL games in an airport bar. This was slightly different as Cool River Cafe served me the worst turkey sandwich of my life. So there’s that. Otherwise uneventful travel, which is always the best travel. Plus Virgin has live tv on the plane so it was NFL all the way home. Ideal scenario. If you are a regular reader of our trip reports, you will notice this report is a touch lacking in some of the details and color typically found in our reports. Part of this is intentional as parts of this trip are better left not documented and part is because I was slacking on note taking. Occasionally this happens and it reminds me of why I take notes. But mainly, it was to protect the guilty. Beth could not help but add…”Well, until next season this editor is off duty.” She does not realize that this year is out of order and she has two more coming. TCU finished the season at 6-6 in the middle of the Big 12 pack. The Horned Frogs would lose the Liberty Bowl to Georgia 31-23. After Baylor opened the season 6-0, this game was the second loss in a string of 6 loses to close the season at 6-6, 3-6 in Big 12 play. The Bears did rebound to win the Cactus Bowl over Boise State 31-12. It was a season mired in controversy that will certainly extend into the off season. 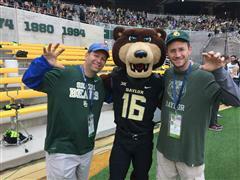 For our Baylor photo album, Please click here. You can view as a collage or run as a slideshow. There are comments to explain what is in the photo but most are self explanatory. Thanks to Google, I can no longer embed the slide show with comments. Awesome trip report….. after reading it and viewing the pictures, I actually can remember some of it. I don’t know if that is my age, or perhaps the alcohol, or maybe both….. Being a guest on a Quest trip is highly recommended!! !